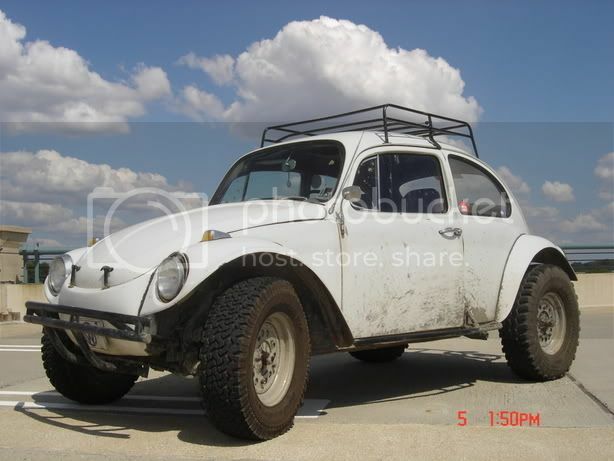 I was wondering if anyone knows if and where you can buy a roof rack for a 73 Baja Bug? other than the old stock style, preferable a tube type. I would like to keep my spare and jack on top so it need's to be strong Thanks. Do you have a picture of what you want? Something like this but mounted to the drip rail? Either one would work. Mounted to the drip rail or through the roof. The top pic. is really nice, not sure if I am going to mount my lights on the rack or the bumper. Its not a wonderful dream its really me! We can build you ant rack you want. I will post pics of one we did a few weeks ago..... as soon as I can find where I put the pics. Ok... itll probly be atleast a few months but Ill keep you in mind when i get ready. I would be interested. I have been actively looking for a used Yakima basket for months. I have Yakima towers and 48" bars currently on my Baja. Any information you can post would be appreciated. Here is one of our racks, built from 1" tubing, very strong. We can build any configuration you want, drip rail mount, roll cage mount, with or without light mounts, etc. I can build you what you want. I can bend 1", 1.25", 1.5", 1.75", and 2" tubing. Just get with me, I'm in Murrieta. Daryll, Do you ship? I am in San Diego What kind of price for one somthing like your last pic. drip rail mount with out light mounts. As far as pricing, the one pictured would run $625 bare or spray painted, powder coated depends in the color you want. 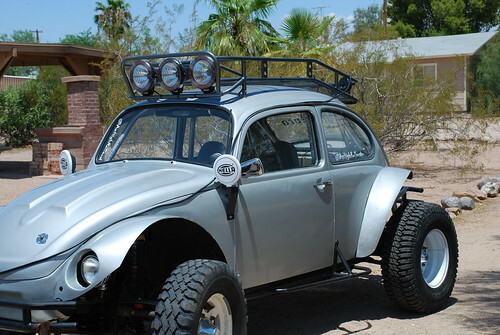 A similar rack without the light bar would run $550. We can do them either drip rail mount or cage mount. Cage mounted we would need the car here. It may seem like a lot of $$$$ but keep in mind its almost 2 days labor plus materials. You wont be disappointed in the quality!!! You should price a yakima rack, they will run you more and are made from thin wall tubing, and the baskets usually dont have a bottom to them. We take cards and paypal. I agree, I have had the yakima stuff in the shop, its made from 3/4 .065 wall or thinner tubing (havnt cut one apart to tell for sure) and God forbid you hit a tree limb real hard it would rip it to shreds. We make ours from 1" .095 wall or .120 wall if you dont care about a little extra weight. Same price either tubing. Projects and Builds project "Willy Style"
[ Go to page: 1,	2	] 27 MuddyPruett69 27871 project "Willy Style"
[ Go to page: 1,	2	] 16 mikehtiger 27892 Re: Roof Scoop?